Well Philip, my recollections of the Harz at Warley were indeed somewhat more Trains could be run. But they were doing things pretty well OK to my eye. New Locomotives coming out for inward trains at Wernigerode. Passing at Steinerne Renne. What I guess the line lacked was Drie Annan Hohne. But the space required well. 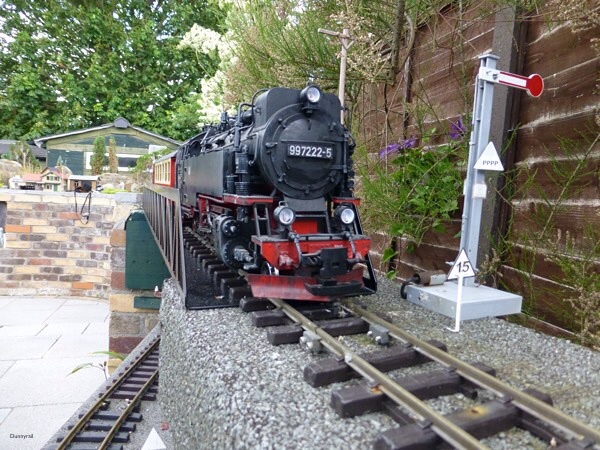 Plus of course passing on the real line can also carried out at Gerteveg Siding, Shierke and Wernigerode Hasserode plus could if required can be carried out at Wernigerode Westerntor. To get that lot in to your Room you would need to be thinking about HoM! Would be more than happy to think out a TT for you but would need to know your Stock Situation and the revised Layout that you have. Communication between stations could be by a sort of Block Bell System. Nothing complex, buzzers cheep from Maplin would more than suffice. Acknowledged by 2 Buzz only OK can Take. 3 Buzz Train refused as have earlier train due to you. Train 69707 the 0836 from Gernrode will be a Railcar to Sternhaus and Terminate here. The Railcar will return from Sternhaus as 69704 to Gernrode starting when Bus Connections have been made. Train 69704 the 0848 from Harzegerode will Terminate at Magdesprung. This Train will return as Train 69707 when Bus Connections have been made. Train 69702 must be held at Silberhutte untill Train 69704 has arrived in the event of Late Running. After this all trains must Pass their respective Trains at their Booked Passing Points till the end of the Days Running. Train 69707 will not be able to move any Goods from Gernrode On this day. After Magdesprung any Goods available can be worked as required. Train 69704 may only work Goods between Harzegerode and Alexisbad. 99 6001 on Train 69704 standing at Magdesprung waiting for Bus Connections from Sternhaus. Railcar at Sternhaus waiting for Bus Connections from Magdesprung to form Train 69704 forward. In the best of traditions, 3 Locomotives were used to test out the strength of the Bridge prior to Service resumption. 99 7222 on Train 69709 the 1136 from Gernrode, the first Passenger working over the Bridge. First seen approaching the Bridge then passing over safely. The same Locomotive is seen later in the day returning to Genrode. And the old Timber was quickly cut out with my Trusty Utility Saw. I wonder how I ever managed without this beast before I picked it up in Lidl just after moving to St.Neots some 2 1/2 Years ago. 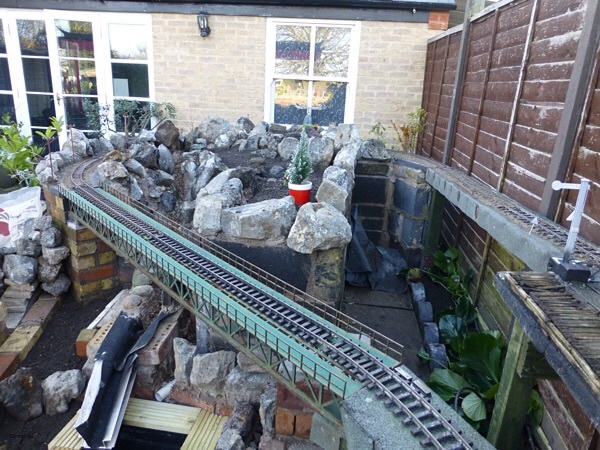 The new Bridge was quickly installed once the old one was cut out, track relaid and the Train Working as told at the beginning of this piece was carried out. 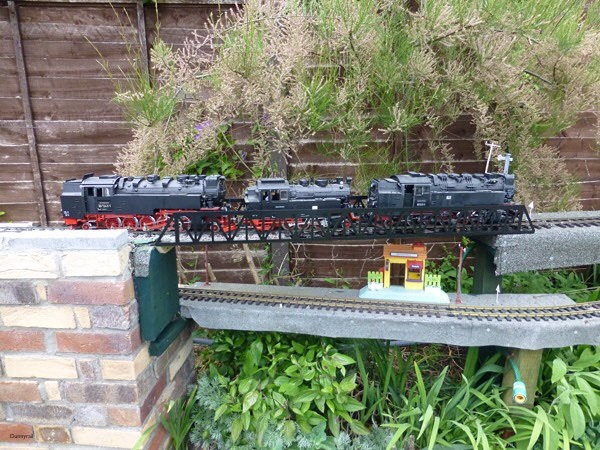 All in all it did take just 2 Hours to install the new Bridge and I am very happy with it. Such a long time since my last Post. But there are reasons, not least the Change of Forum Style and the difficulties in finding my Posts. What I normally do is to keep a Webb Link on my iPad going to my updates from that. However with a change in Forum Style that no longer worked so the learning process has taken me till now to find my old thread. I am sure you can appreciate how happy I was to find that it had not disappeared! 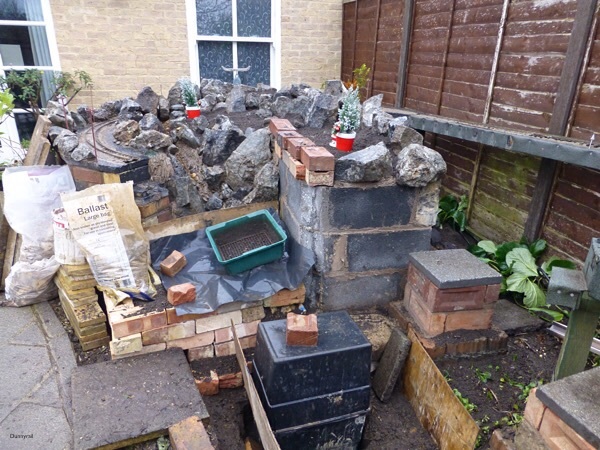 I have for some time been having thoughts about creating another Rockery in the Garden and to this end have been collecting Bricks. A few of the pile can be seenin the first pic. In truth last Year I was around this time offered a pile of Bricks but sadly the lady concerned 3 doors down dithered for a variety of reasons so they never appeared. Thus I have been Skip Raiding (with permission) all this Year and finally amassed enough by around October. Thus I could make a start. Firstly the old Timber Circle was taken out thus splitting the line between Silberhutte and Lindenburg. 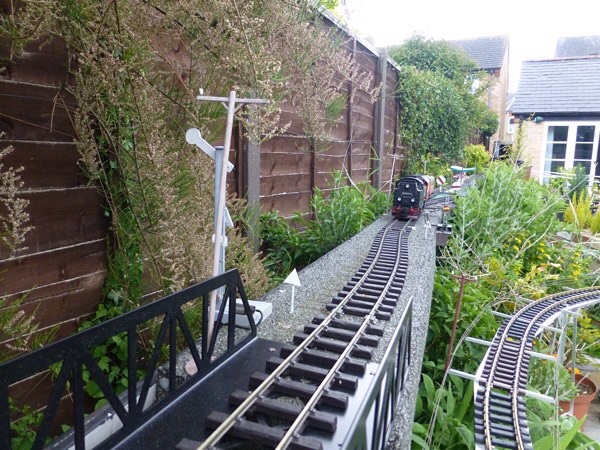 Work had to be completed to have the circuit in place by Christmas Day for my annual Milk Train Run at 1100 precisely. 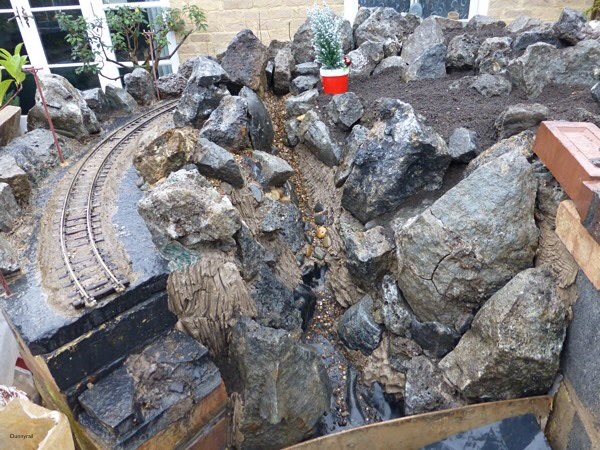 I have managed this, but the Scenics IE Planting will not be done till perhaps Spring when Rockery Plants will be installed. One of the main reasons for this work was that the site area had been infested by Mint. Any of you that have any will know how invasive this drated herb can be. Here is a picture of the site as seen this Summer. 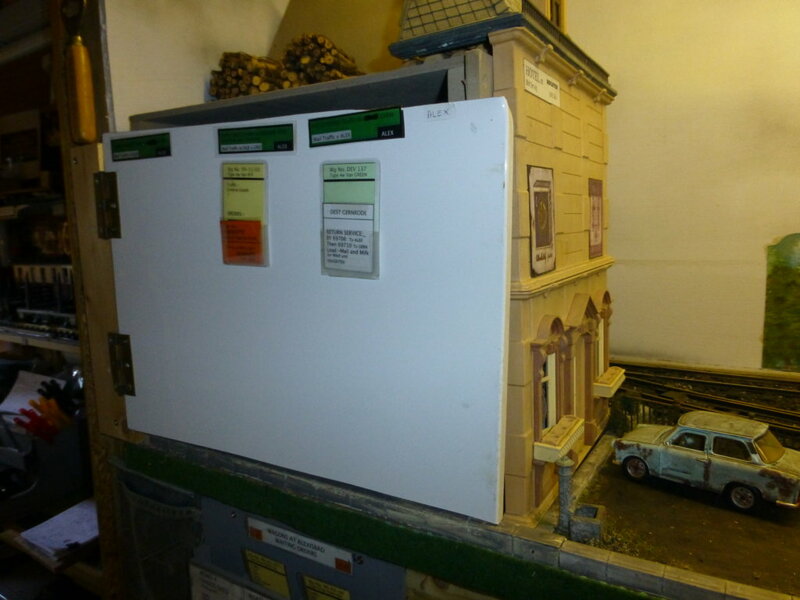 There are other pictures of this area in both this and my Marklin V100 Bash Thread. 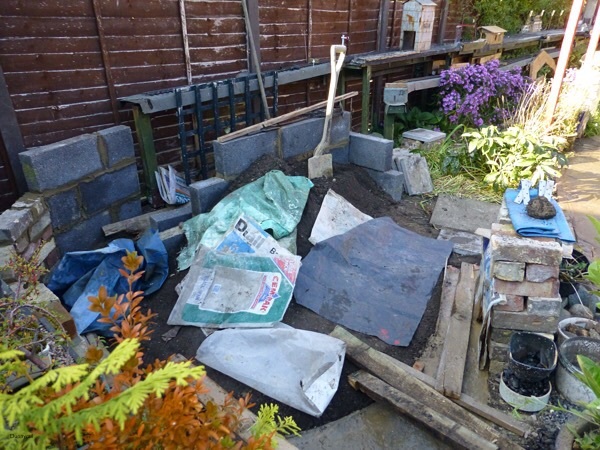 The work has entailed the removal of 2 Large Skip Bags of Soil, all of which has been Sifted to remove both the Mint and all the many desirable plants which have been replanted in a Temporary Nursery that I have created at the bottom of the Garden. Currently one lot of plants have been removed to this site, been replanted and it currently hosts another lot. 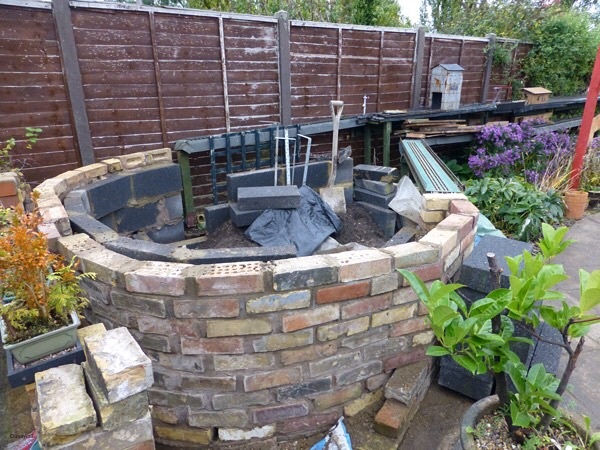 The loop has been created with a circled Brick Wall with a second wall inside with Breeze Blocks and Bricks. 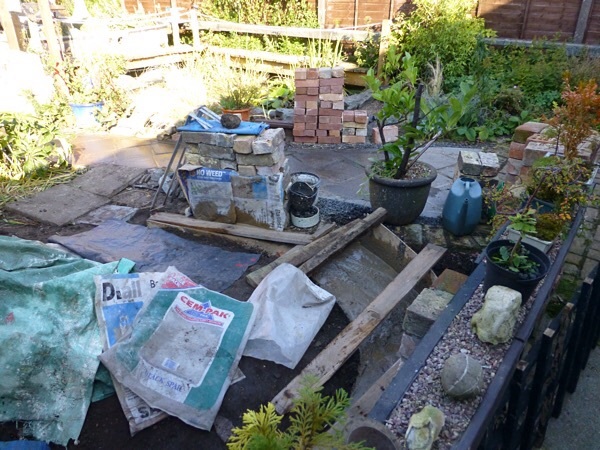 The lot being topped with Cut Recovered Paving Slabs given by a very nice lady that drinks in the same pub as me. Her fee being a Shed that I refurbished for her. Live Barter, save loads of Money for both parties. 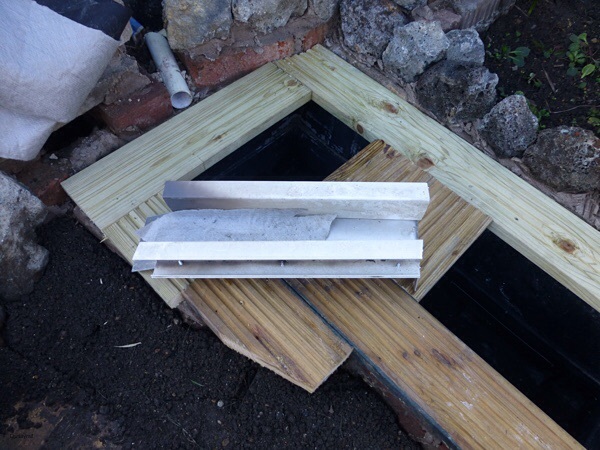 The slabs did have to be cut to go in place to make the 'Baseboard Top' but Mr Angle Driver soon took care of that. 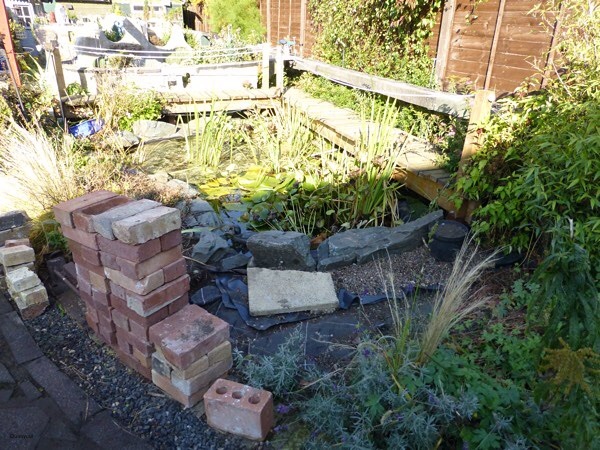 The rest of to Slabs are to be used for a Small Entry path behind the Loop for Plant Maint, another short path in front of the Pond and to Top a Dwarf Brick Wall that is to separate and keep the path tidy. At just or 3 Bricks high this will be small beer to Construct. I had another bit of luck with this project. Whilst looking after a friends Dog I noticed that some nice person had dumped a load of Rubbish at the Top of my Road in an area that is Wild and has undefined ownership. As this was discovered at night I could not look at it with any concept of what the said Rubbish was. 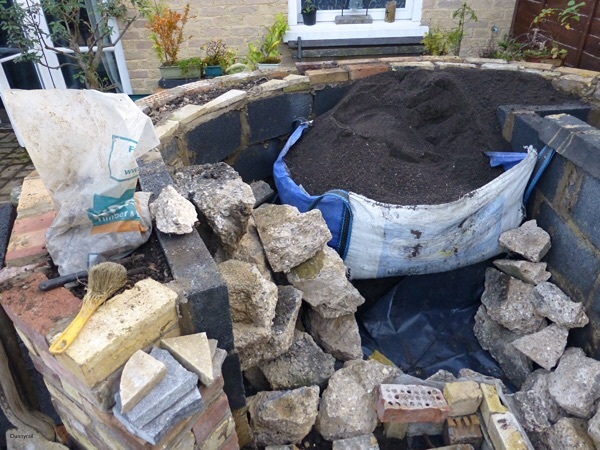 On looking at the pile next day I was happy to see that someone had dumped the contents of a Rockery! 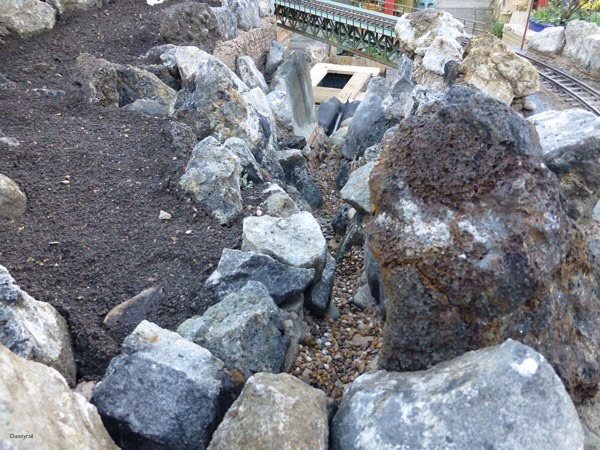 As I was about to go out and spend circa 2-300 Quid on Rockery Rocks you can imagine how pleased I was to find probably 5-600 Quids worth a 2 Minute Barrow walk away. Let us say I did the Council a big favour and sometimes an antisocial act can have benefits! 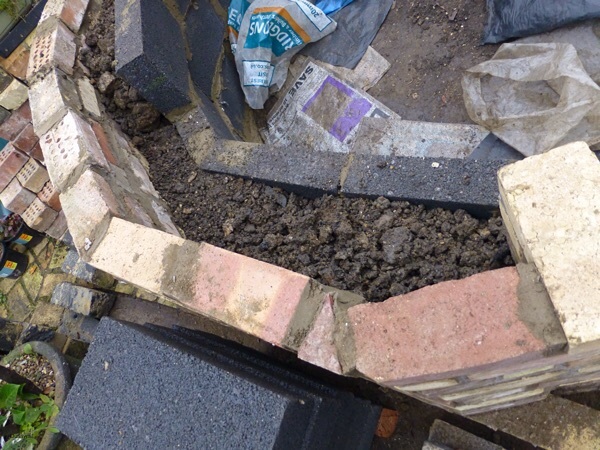 Final pic this post shows the state of play before Slabs put on. I have more pics to show and will post them when my Round Tuit is back in full order. 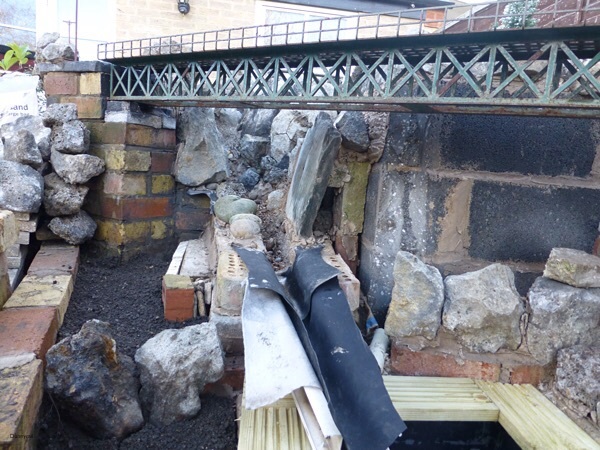 Just behind the second image taken from left of the first one you can see the small Path that will be hiden behind Rockery Stones. 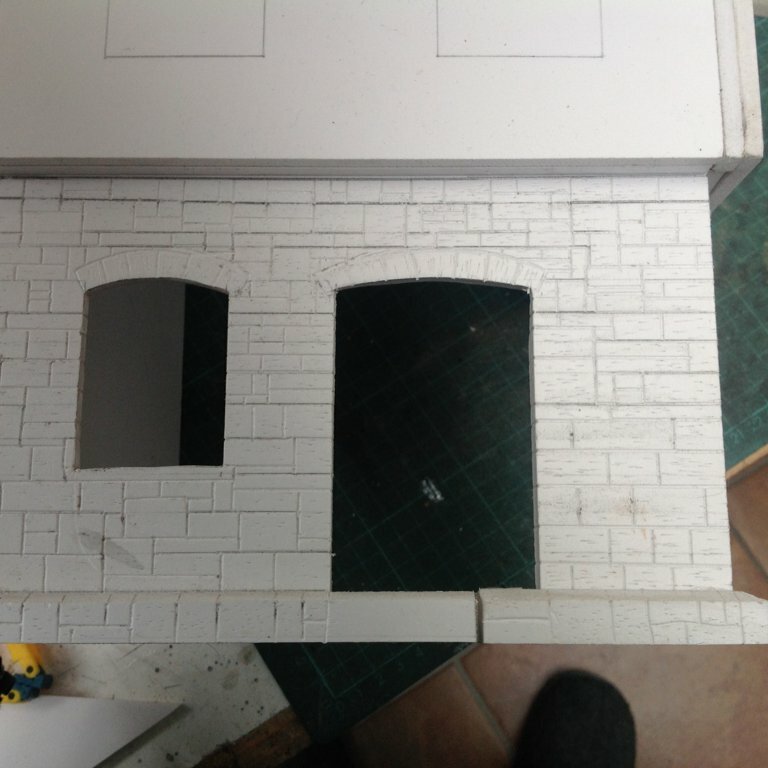 Also in this pic the Bridge is out but the New Brick Support can just be made out Midfle Right with the original and still to be used Wood Support for the other end Middle Top. Plus the first load of Soil put into the created Circle. This used an old Skip Bag to both keep it in place during construction and get rid of one of the many that have been lying around the Garden for some time now. As promised some more pics of the destruction oops construction. I used many old tricks in this build. 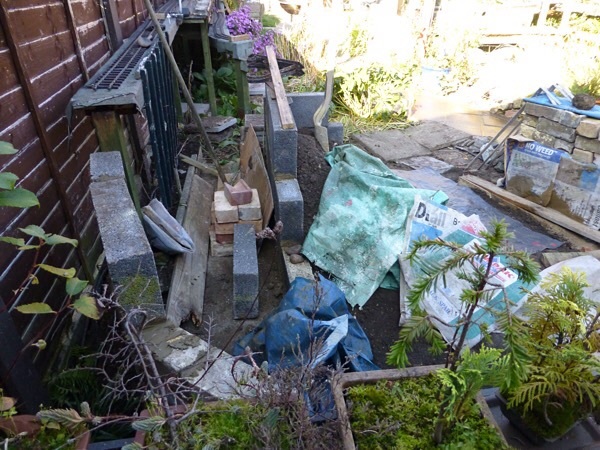 Not least getting rid of a Skip Bag full of Concrete Rubble when the path was dug up for some Plumbing changes to the House. Builders wherever I live think I am a bit odd in that I insist they do not price up to remove Carp. 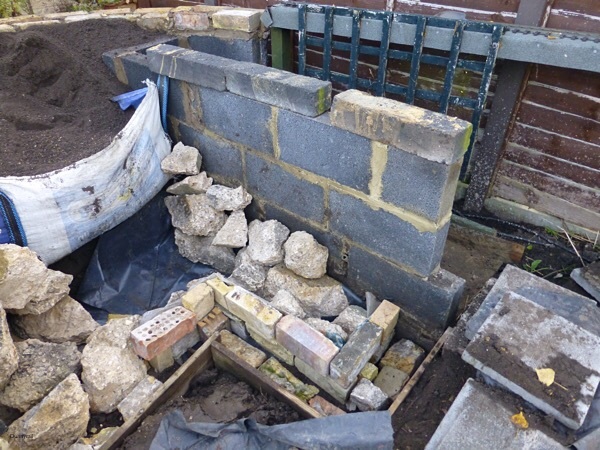 My other is to use the Stones left after Sifting Earth so as to build up Footings for the walls. In truth here I am not building a House and the Foundations built this way searve two purposes. One to help get rid of the waste and to help reduce costs a bit. Generally I use 1 Bag of Ballast, 1 Bag of Rubbish and about a third Bag of Cement, thus giving me 6:1 Mix. 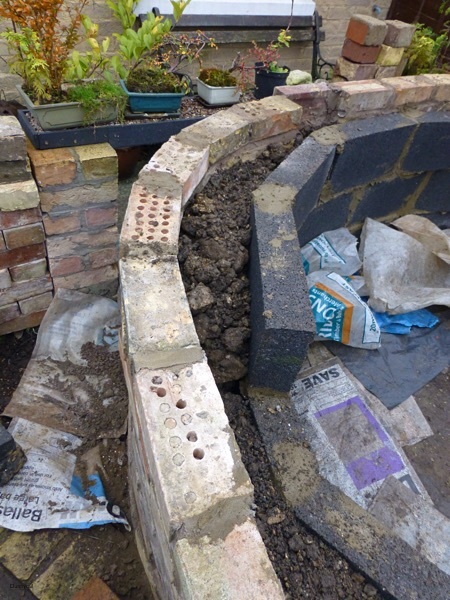 More than adequate for a Garden Wall which is in effect what I am building. Another way of getting rid of Waste after the Good Earth has been Sifterd out is to dump it in between the two Walls of the Track Base. 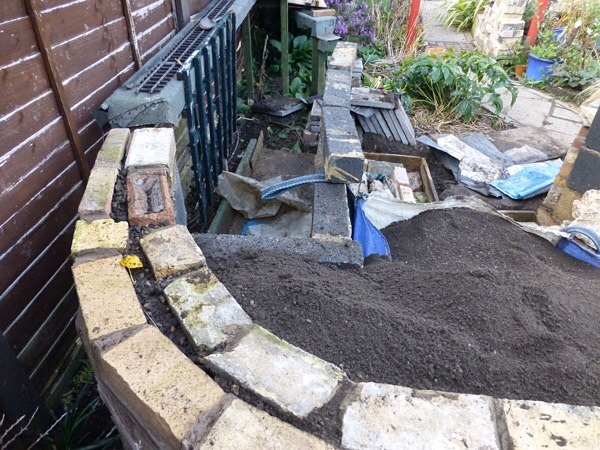 I first though always put in good drainage at the bottom using Rubble with gaps or even old Drain Pipe to ensure that I am not making a Big Lake to destroy the walls. An old Sand or cement Bag on top of the Rubble then the Waste finally a bit of Cement gives a good area to cement the Slabs that eventually go on the top. 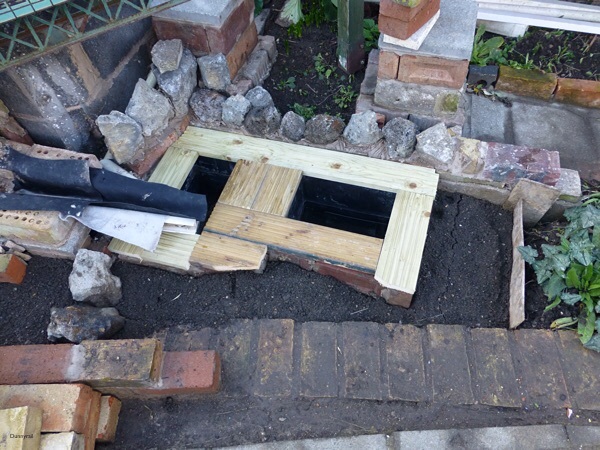 Speaking of Slabs, to get my Grade here roughly 1:40 (not sure what that is in percent, do not understand Grades in percent) I used broken Slates, Slabs and bits with Cement filling the Gaps when the Paving Slabs mortored on top. 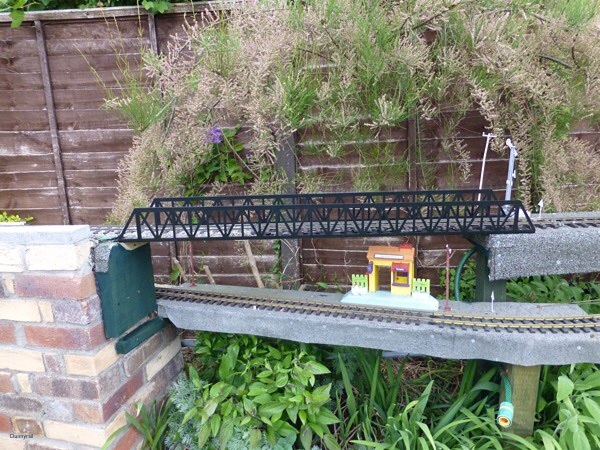 Now some pics showing all sorts even a Trial fit of the Bridge. 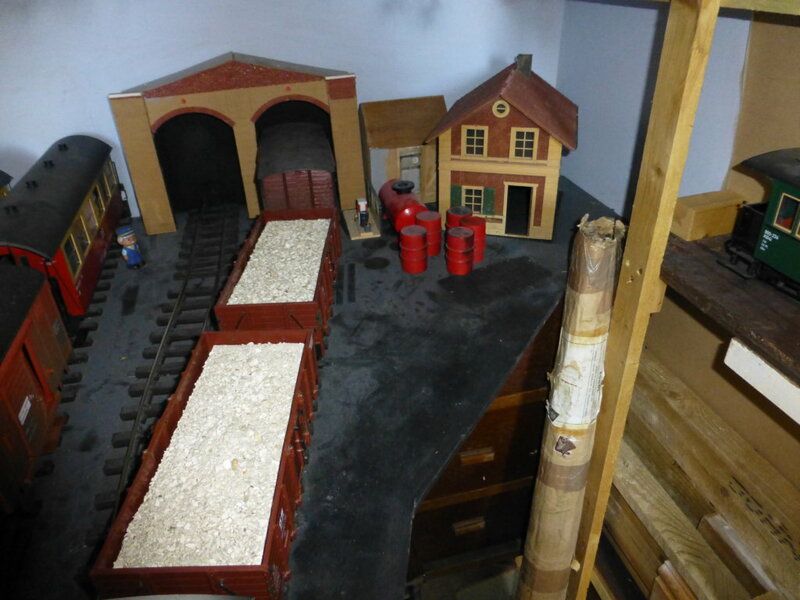 A few more pictures, the final ones showing Preparations for the Christmas Milk Train. 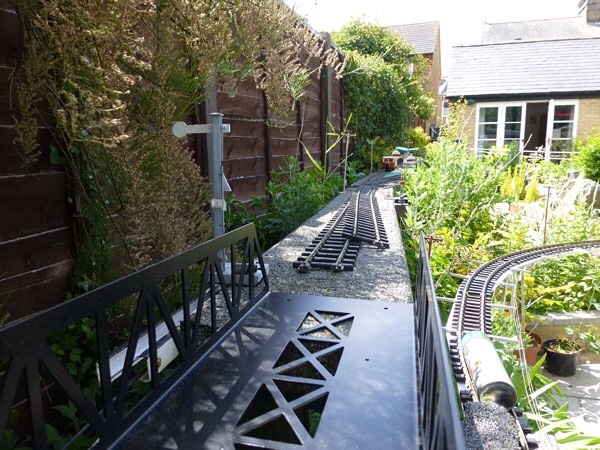 Though the Bridge still needs to go back, that is a Simple process as the Track is all joined with Massoth Clamps. Bridge just sits on the supports. 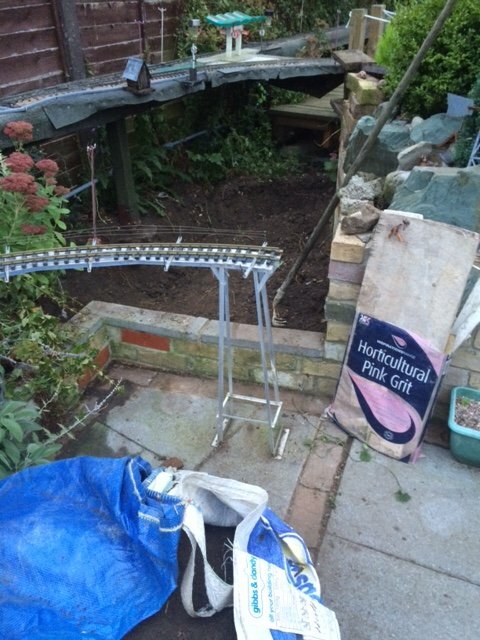 The first two pics show how I used a Skip Bag (in Blue) to retain Soil in the Loop so that I could work. 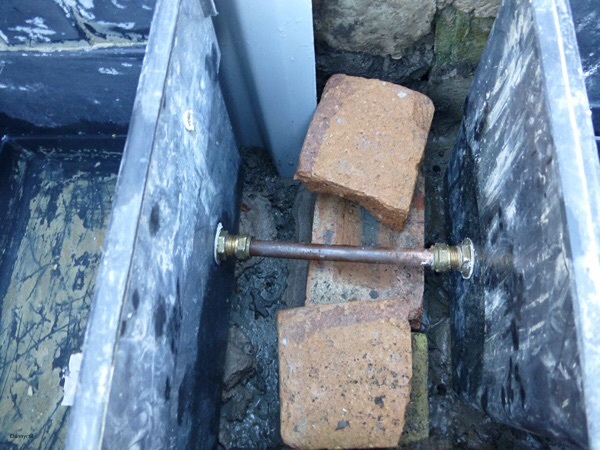 These also show Concrete Rubble as dumped to further help Drainage via Pipes in the Block and Brickwork. 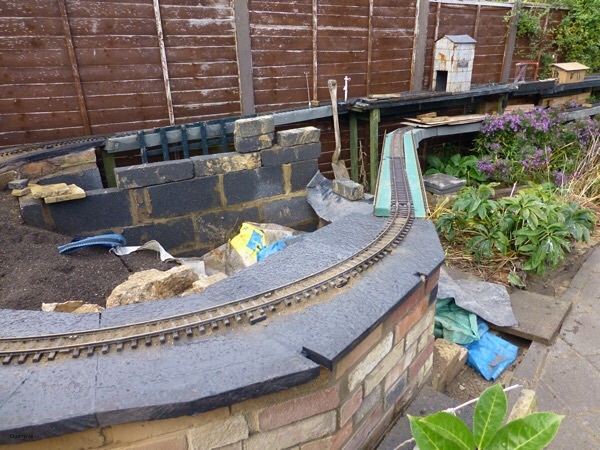 The next 4 show Slabs in place and some derisory Track Laying. The final 4 with the Red Santa Plant are as the line is today with many Rocks in place and most of the Soil in place to get started on planting out. Certainly shades of Dawlish Rebuild here! 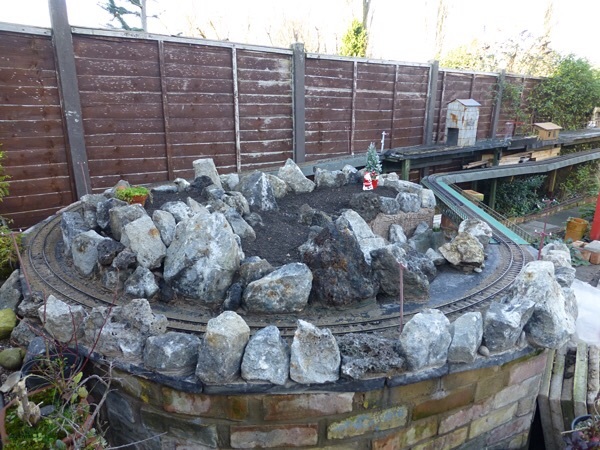 Genuine Miniature Conifers will be used, where the Loop gets lots of Sun it will have Alpine Plants. The site is a Mixture of Shade and High Sun Exposure so that will effect the planting. At the front in the last 4 pics can be seen the two Hot Water Tanks that will be part of the Waterfall Recycling process. 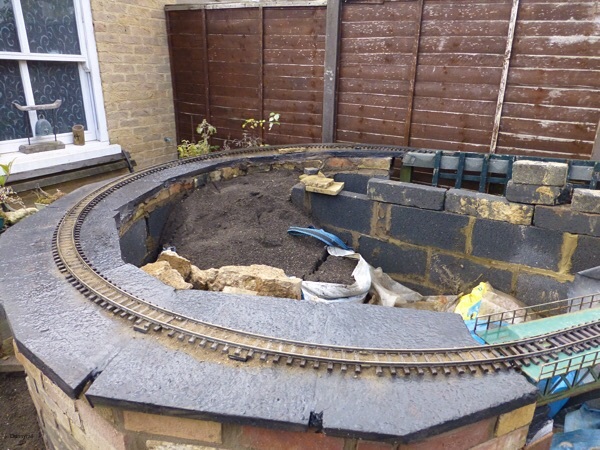 I will be using another Solar Pump for this my second Garden Water Feature in this Railway. Oh the track here has been Ballasted with Postcrete. I have in the past sifted it to get the Larger Stones out, but have not bothered here. I also used Postcrete to fill in a Large Gap where my grading got messed up! In effect the Track sits on about an inch of Postcrete. Big fiddle but it worked. The last post ended with my preps for Christmas. 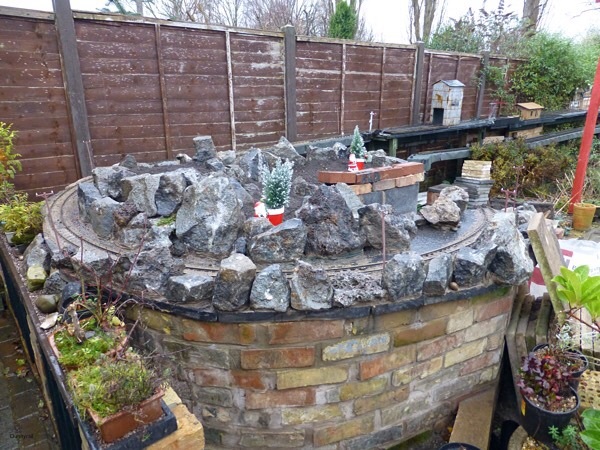 This last couple of days I have been fiddling with the Water Feature. 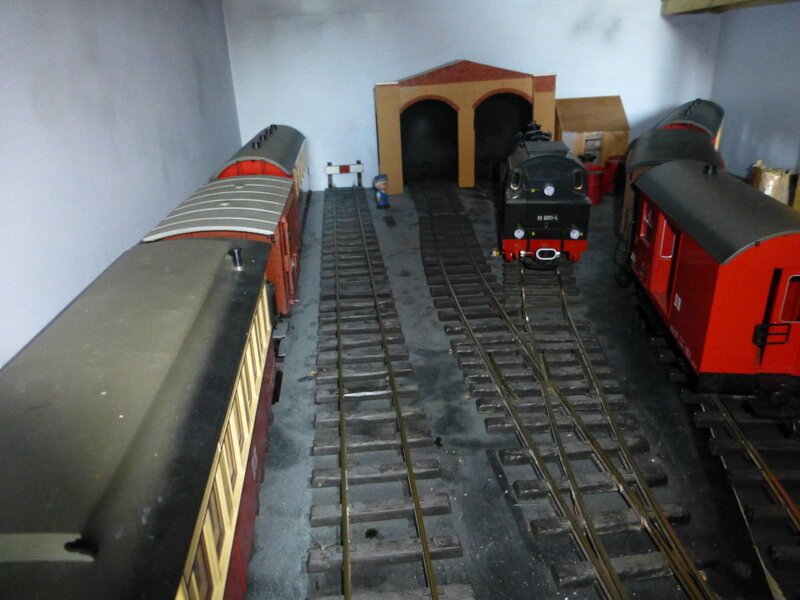 The Two Tanks have been joined by using Tank Pipe Exit Fittings, one in each Tank with a a short Length of Copper Pipe to Join and Balance the Two Tanks. This is because I feel that the Water Run may be too much for just the One Tank. Currently there is Water up to the Top of the Joint to ensure that my Plumbing is up to scratch. 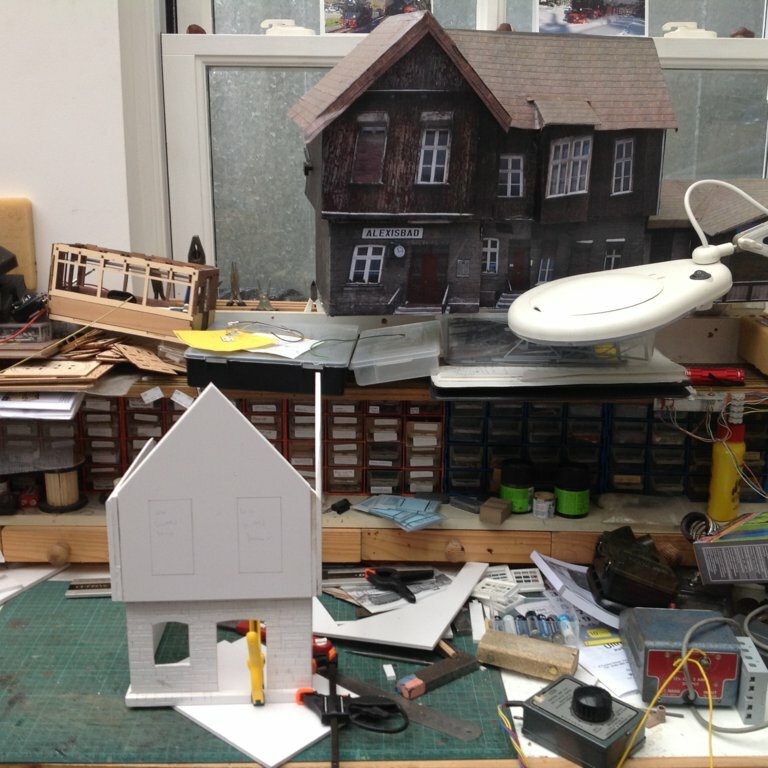 The end of the Water Run is near all Modelled now. 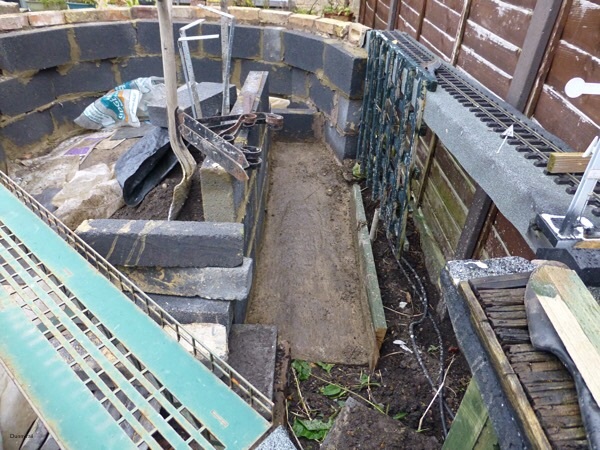 Just a bit more Concrete and Stones then it will be painted with Clear G4 Concrete Sealer for Ponds. The final bit that leads it into the Tanks is shown removed from the Run. I wanted something removable in case I ever need to do some Work on the Tanks. The Water will exit just beneath the point where Water goes into the Tanks, running via the White Pipes. This will use smaller Gauge Pipe as I used on my last Water Feature. 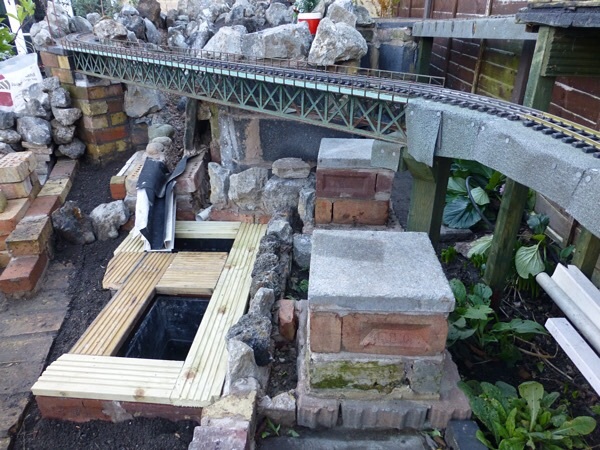 Once the Water has been lifted it will again run via the Top of the Walkway to the Top of the Waterfalls exiting via a bit of Pipe hidden by Rocks. The Pump will again be a Solar Powered 12Volt one. 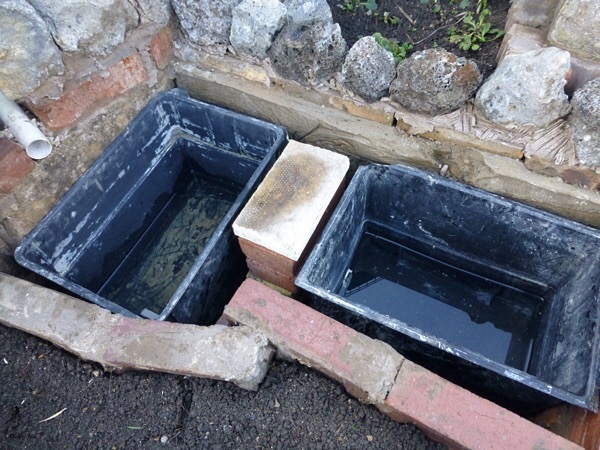 Overflow and soak-away will be taken care of by the Divit Broken of the side of the Right Hand Tank. There is plenty of Fresh Air around the Tanks to allow Soak Away in deluge conditions. 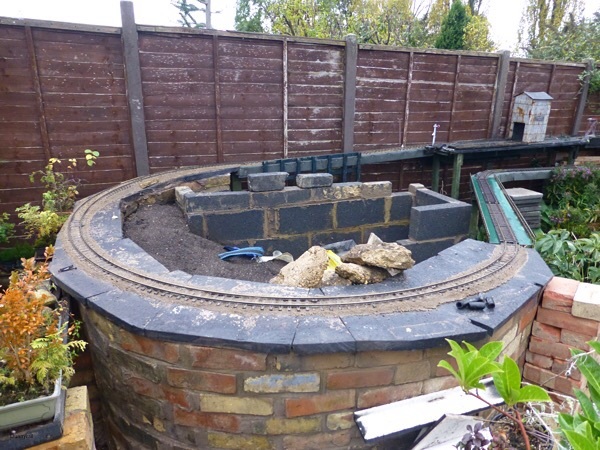 I am hoping to put a Water Tank on the Wall to Harvest Rainwater from a Down Pipe. The Overflow naturally filling the Tanks. I will arrange the setup so that a Hose Pipe will be able to run from the Wall Mounted Tank to Top up the Feature as necessary. On a Warm Day it is surprising how much Water can evaporate on a Waterfall. I had thought about covering the Tanks with Paving Flags and in Fact all the Edges and Gap between the Tanks will allow for this. However I decided that I would use Decking as I thought it would be nice to see the Water. There is also always the chance of Newts taking over as well. 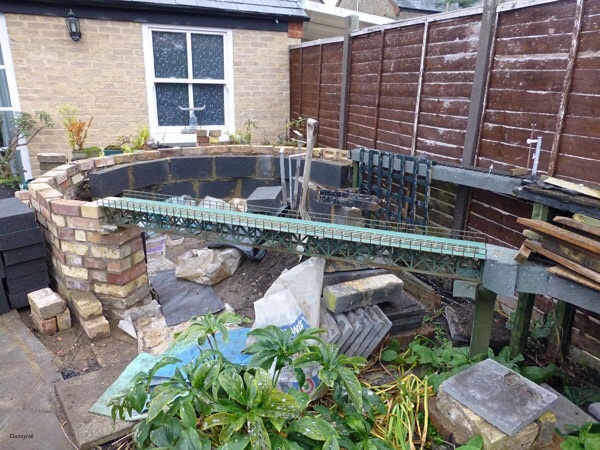 Finally a few more Pics showing how the site has evolved, in particular the Path behind the Rockeries and the Steps to get over the line can be made out in varying pics. I think the Decking looks a bit Stark just now, but I may Stain it and once the Planting has been done it will shrink into the background some. I have browsed through the whole build now. 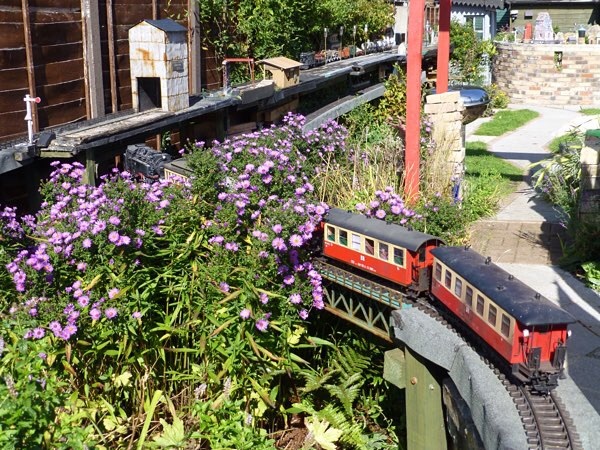 I must say that it is a very impressing garden railway that comes to life there. It gives me some great ideas for my own GR that unfortunately can't start until april when the ground frost has give up. Glad you like it Patrik. I reckon my build might have taken another 2 Years if I had to wait for the Ground Frost to go away. 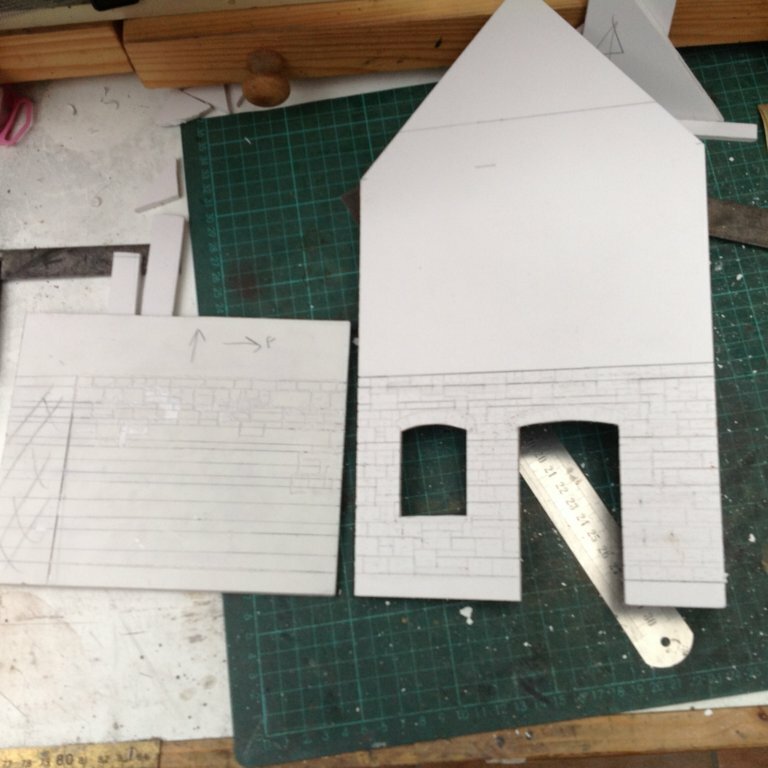 This would perhaps suggest that you may beed to think a bit more carefully about Foundations, their Depth and Type of Blocks to use. Nice to see the 'muddy building site' side of things.. Not a complaint, a shot of realism is necessary! 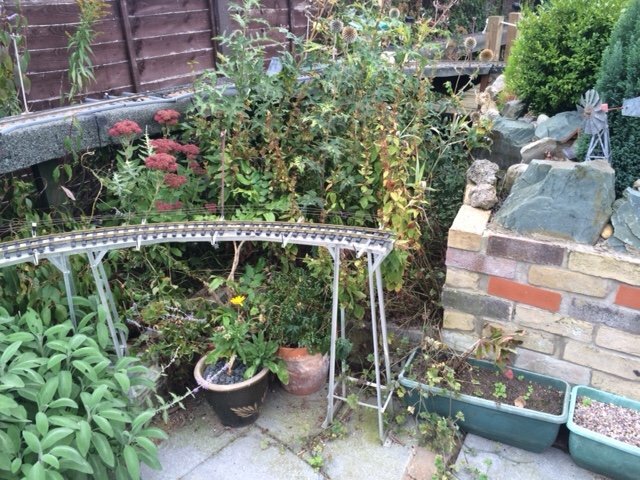 - Especially if I am to get planning permission from Domestic Authorities. I have Staffordshire clay.. I have to choose my moments, else it is either rock-hard, or comes up as a single lump!! Real Ale, Camping It Up, Traveling and the likes. 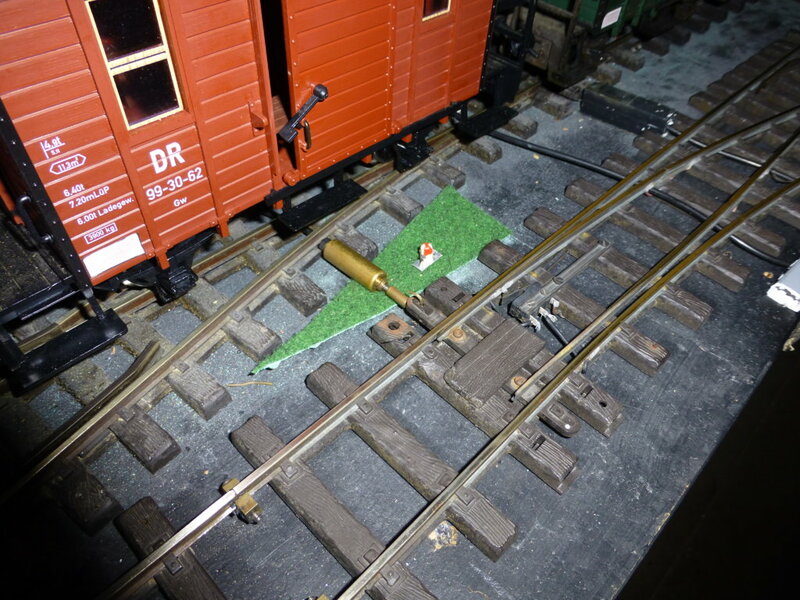 Woodlock Logging Railroad; twinned with the Katzberg Bahn and the Beech Grove Light Railway. Phil, yes sometimes there need to be a bit of reality, as in you cannot make an Omlet without breaking a few Eggs! When done, they tend to love the easy maintenance and effort put into planting. Full trip round my line. Just reposted this to get the Vid Link working again. The stonework has been distressd somewhat by tapping with a Craft Knife. 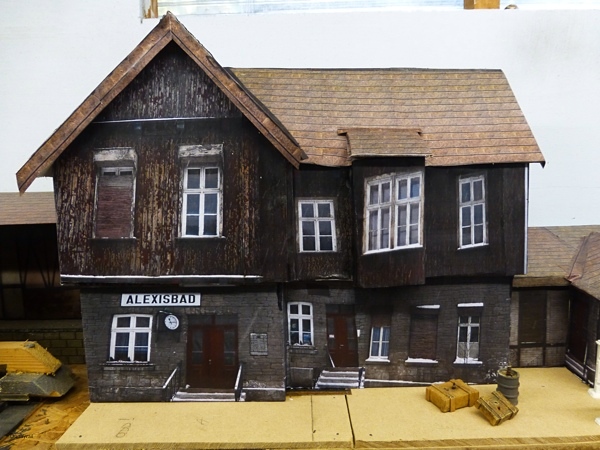 Just realised that I started the thread on the Alexisbad replacement Building here and done a separate thread elswhere. Oh dear! 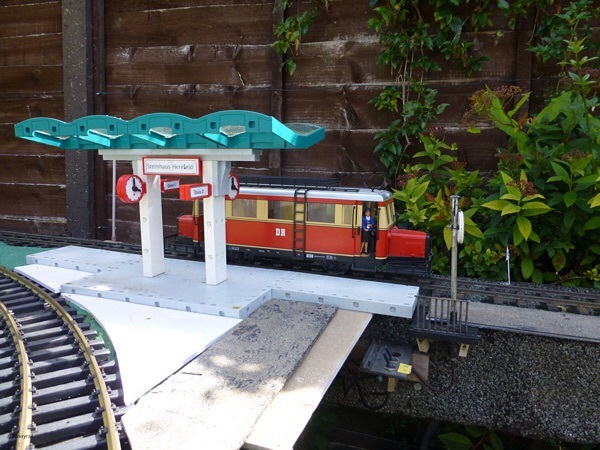 Today I decided to make some changes to my Gernrode Station. The original plan looked at trying to fit another Road in here, but the Boards did not allow for it. On thinking some more I decided to add a bit more Board to get that extra Road in. 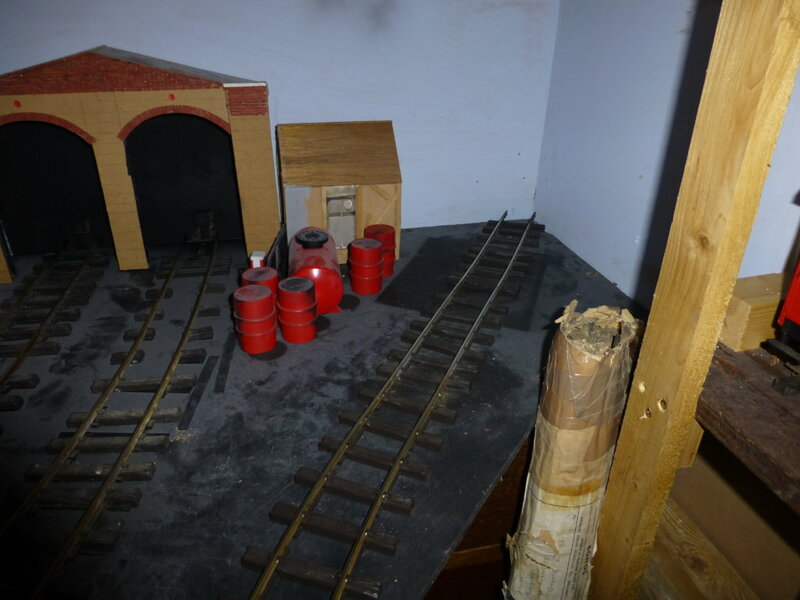 The real Location has 3 Roads for the Loco Shed and 2 for the Wagen Shop. This could have been used for repairing Coaches or even Goods Stock. Though in Germany a Coach is normally refered to as a Wagen! So this is the situation as of 1430 today just after Dougln left for home. 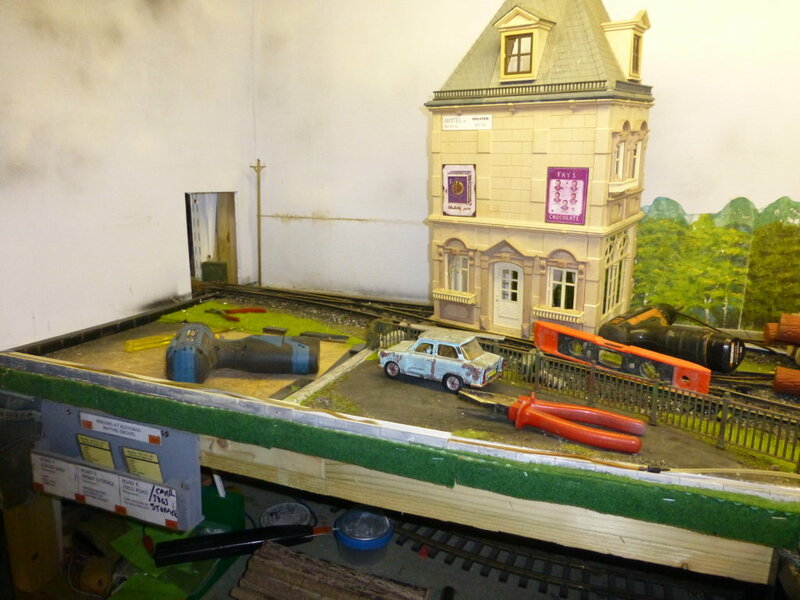 As can be seen if the House was not present there is plenty of room for the Wagen Shop, however taking a Point off the Loco Shed was not an option. So after some fancy measuring I fasioned a small extension to the Baseboard. 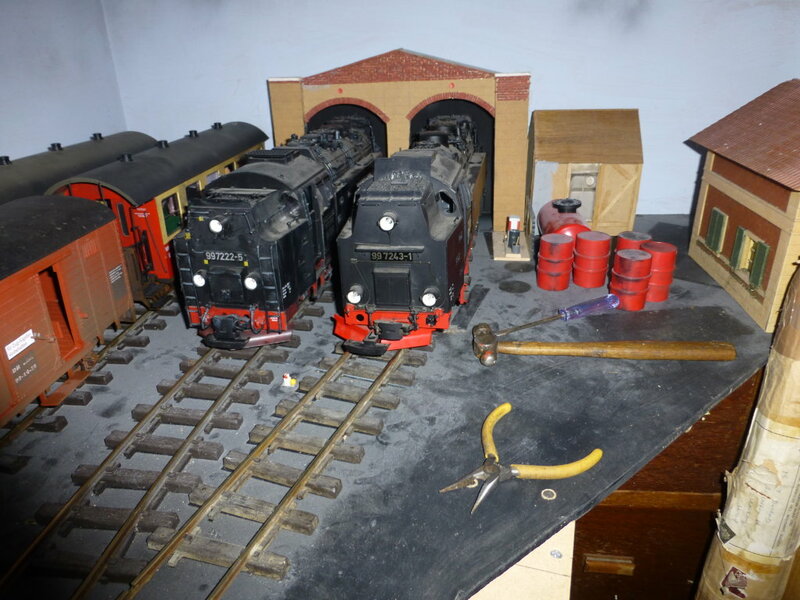 I also wanted to get my 2 2-10-2's into the Shed Roads, originally I planned to move the Point back a few inches. 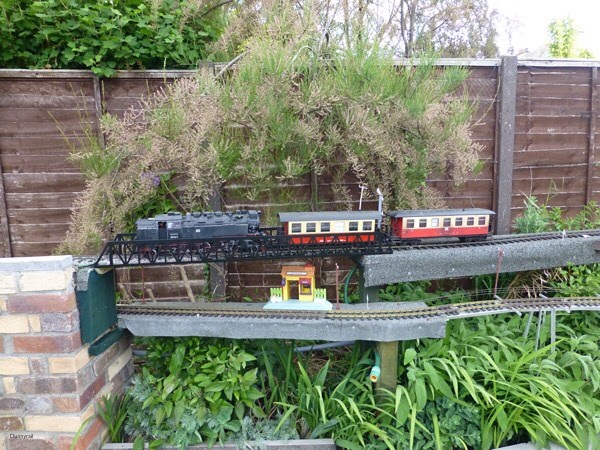 But I found that by tweaking the Track to the Right a little the 2 beasts fitted just nicely. You can see that the Red and White Fouling Point Marker is just nicely clear of both Locomotives. Next up came fitting the new point and laying the Track in place. But before that I had sprayed the Board Matt Black. 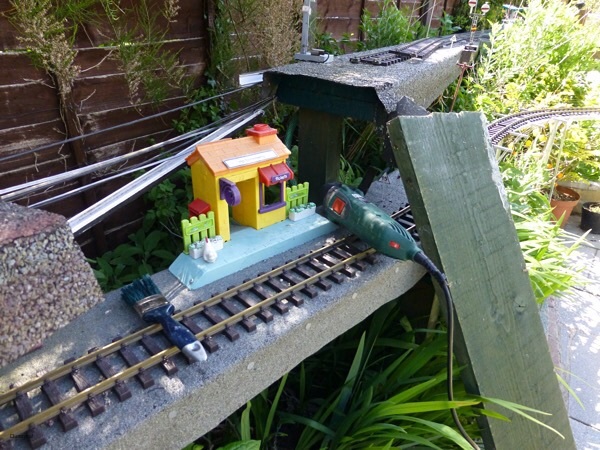 The inevitable Test Run to see all is OK took place after the Track was laid. 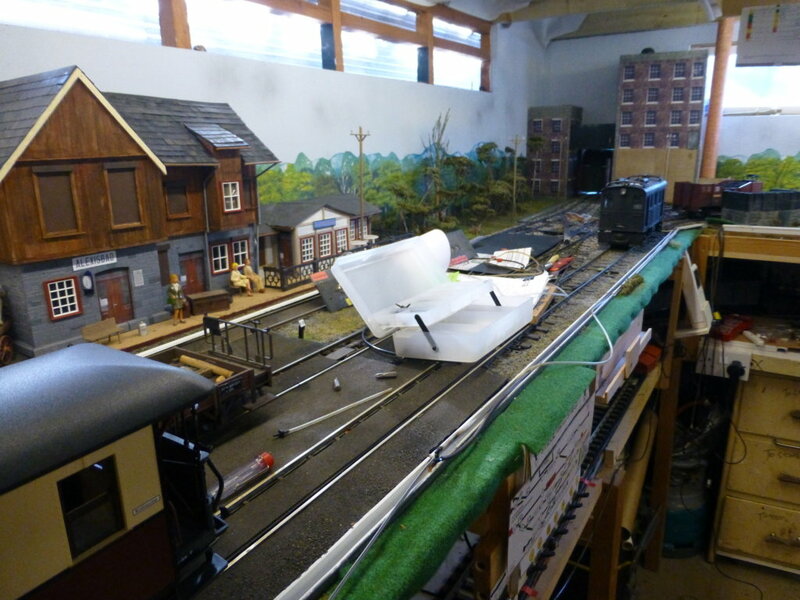 I robbed the Track from my Track Cleaner Shelf in the bottom Shed. It was not really needed there, just some surplus after the last changes to plonk Claening Stock on. 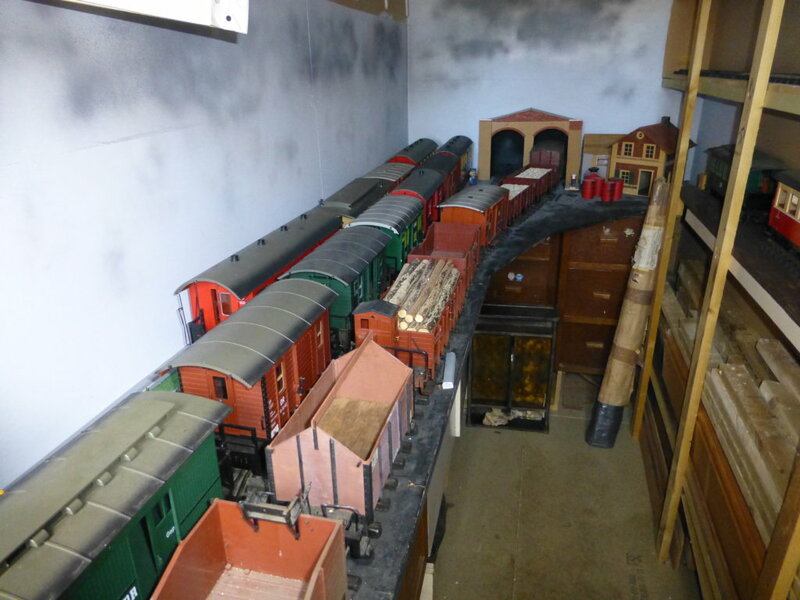 To the Right can be seen some Stock and Wood Storage Shelves not connected in any way to the Layout. You can see here that I have run the Track right into the Corner. When I do the Building this will not be so apparent. Here I am testing the capacity, the Road will take a Coach and two vans or 4 Wagons. A new Air Motor was fitted to the Point. This is the "Normal" Position. Reverce is selected to run into the Loco Shed. A New Lever was added for the Point (a Black Lever on Black Plastic, barely noticeable). However in line with my trying to orientate the Levers in Order, the new Siding is Lever 3 and the Loco Shed Point has now been renumbered 4. The panel Diagram will need to be re-issued as will other Diagrams and Notes on Operating, plus a Number for the New Lever. The New Road has been named 61 which is in order for the German way of doing things even though there are not 61 Roads in the Area. Changes to Road Layouts tend to get some odd numbering. Finally at close of play stock has all been pushed back into the Shed for its sleeping mode. 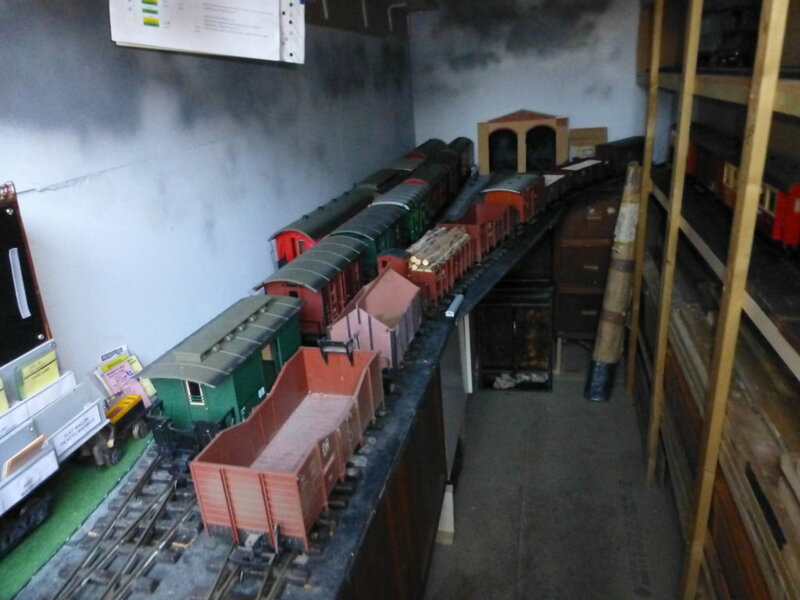 In reality I will be able to fit another 4 Wagons onto Shed Road 6 for overnight storage. I am pretty pleased with my afternoons 3 Hours Labour. All made so much simple by my use of Track Clamps and my Air Operation of Points. 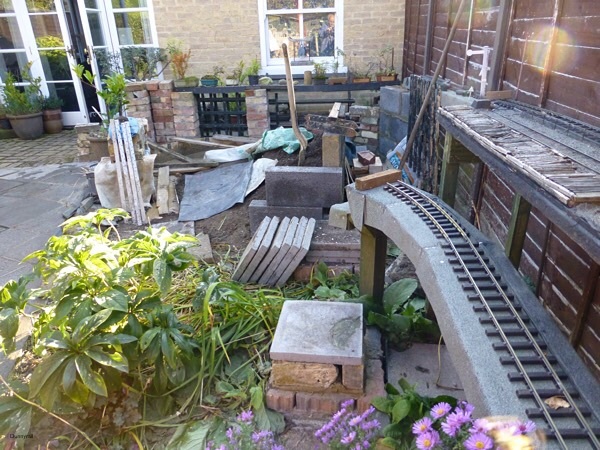 Yesterday some more work was undertaken on the line. For some time now the Shed at the bottom of the Garden has been giving me concern on Operating Days. 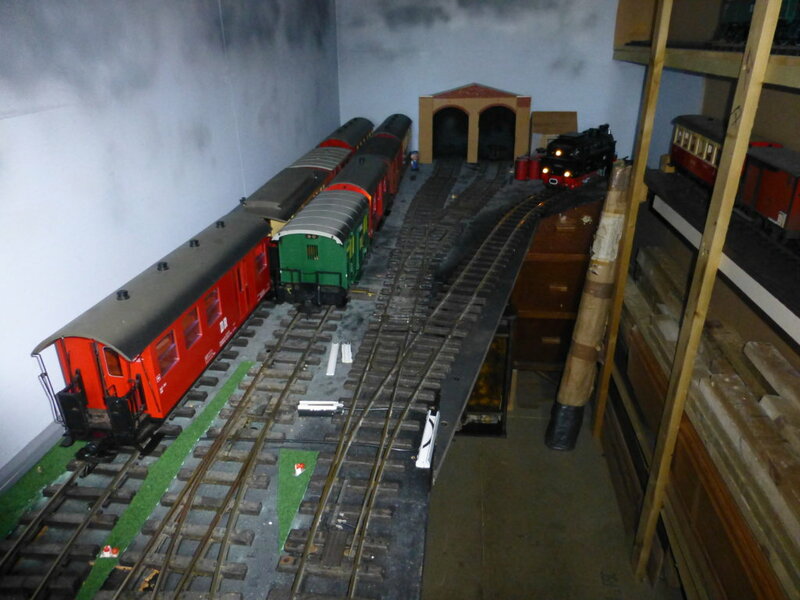 At times there can be 3 Trains working in the Shed and with 3 Bods in there things got a bit congested. The problem was that the Control Panels were in the wrong place. 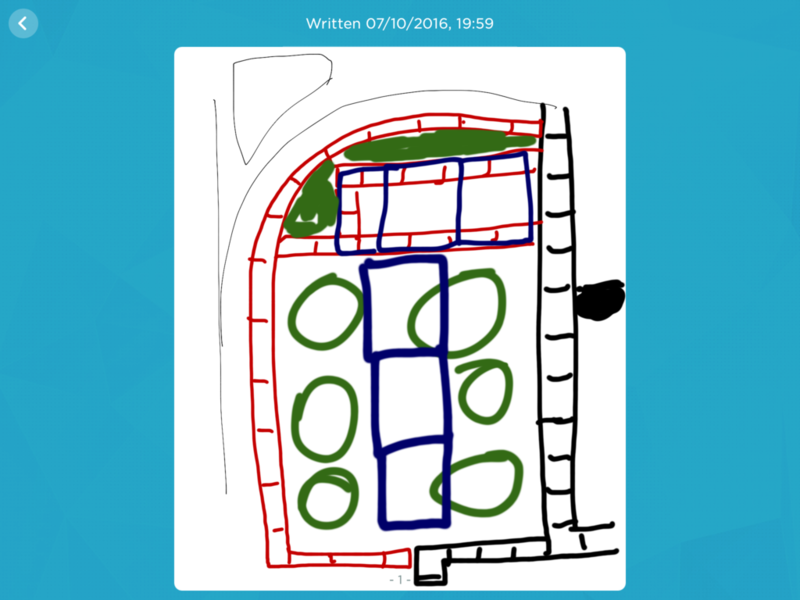 As can be seen from the crude sketch below, 1 in Middle and 2 at the far end. 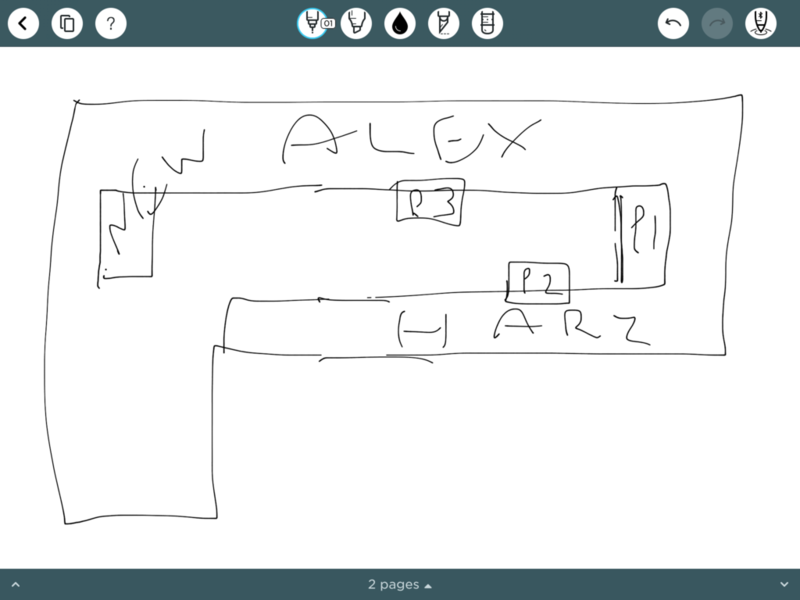 The cunning plan was to Move P1 (Alexisbad) to the Location "New" on the Plan. Work started yesterday around 0830 after Tea and Toast and was completed except for Tool tidy up and cleaning by around 1300. Some testing and the job was all completed well before Pub o Clock. I think the process is helped by my use of Air for Points in the Shed plus the use of Trunking for all the Air Pipes and limited Wire Runs. Mostly the Wire is for odd Track Feeds and during this work only one was in the Trunking that I opened up. This did not need to have any changes. 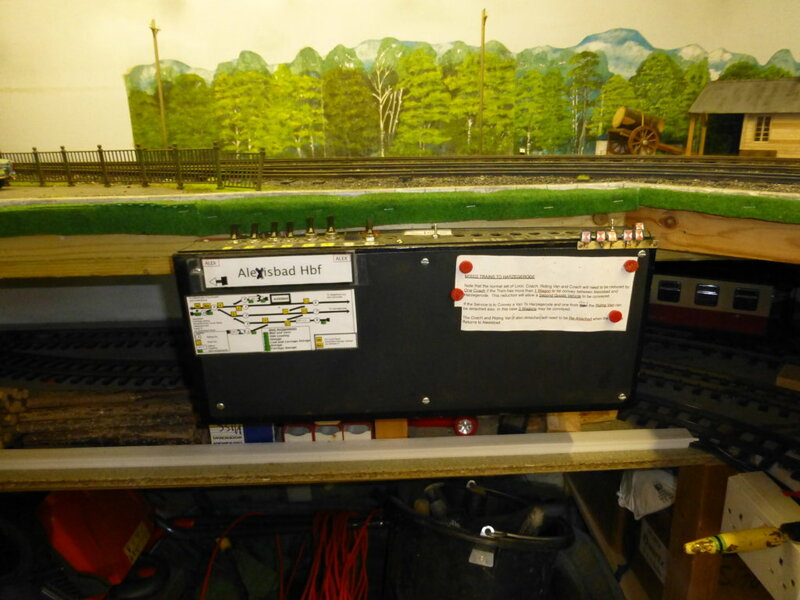 I have some Electric Signals on P1 and these needed to be moved, so the wires were cut and the line moved by soldering extensions. Heat Schrink makes these changes so much simpler to manage. Sadly I forgot to take a pic of the site of Alexisbad Panel prior to starting this work. 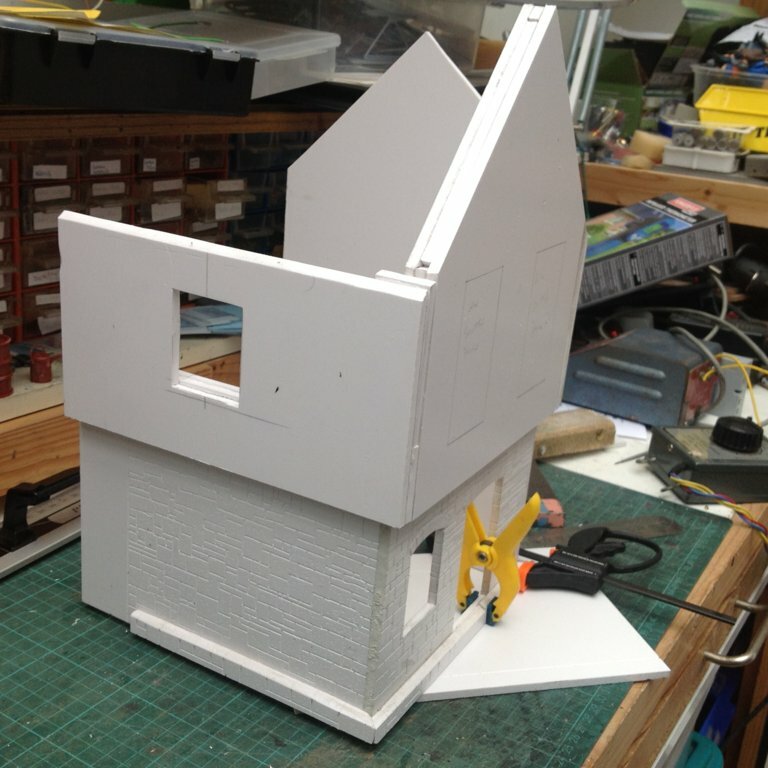 The Building here where the new Panel will go is removable so this makes things so much simpler to work on. Bit messy with the Tools littered around. The old site of Panel one above the Massoth CS and Power Switch Panel The Switch Panel only gets used for Fault Finding, normally all Switches are On for Ooerating days. You can just make out the Air Switches dangling to the left after the Panel was removed. 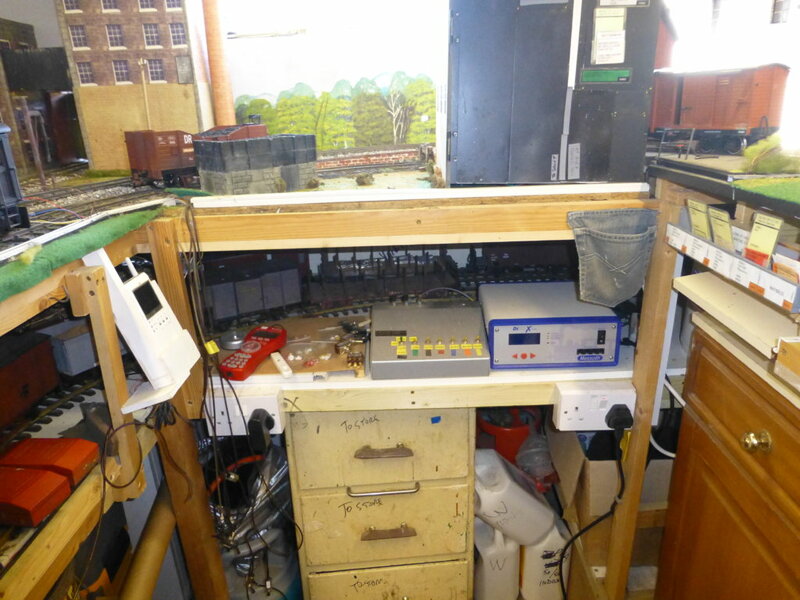 More mess, as can be seen the Trunking has had its lid taken off and Air Lines being messed about with. The New Air Control Panel, again never used during Ooerating Days. 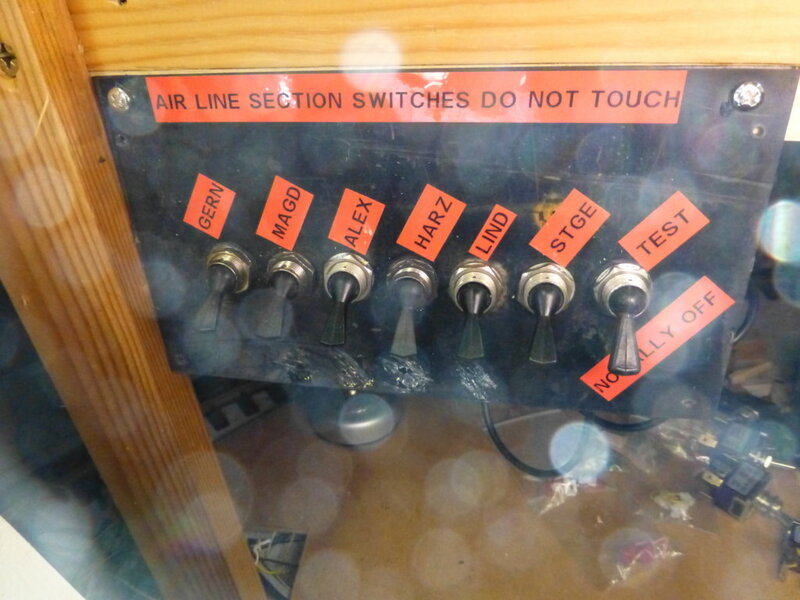 All switches are just on except for the Test Switch which is used for Testing Faulty Air Motors or Switches. A rare event it has to be said, but it is so much better to have the facility than not. 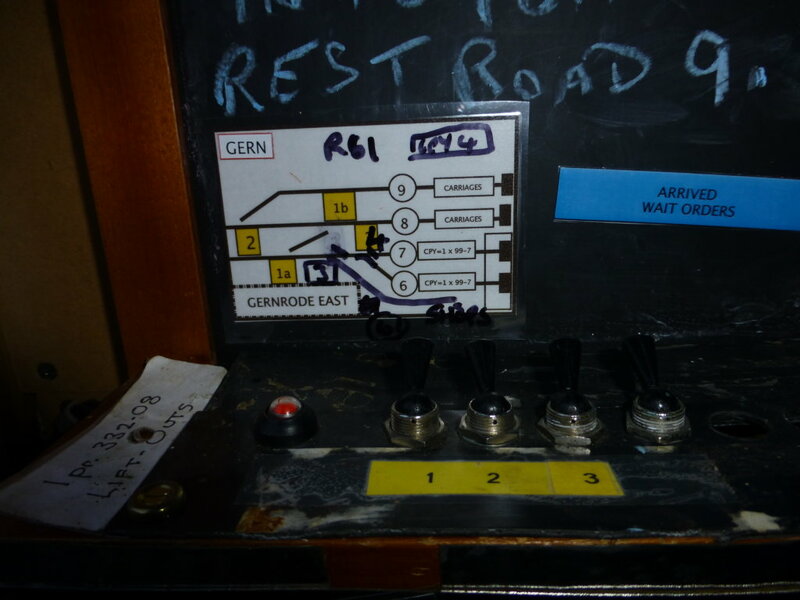 The Panel in its new location prior to any fitting of Controls. Whilst moving things about it is useful to have Short Bits of Trunking Top to keep things in place prior to putting the Lid back on which will not be done till after Testing has proved the revised instalation. 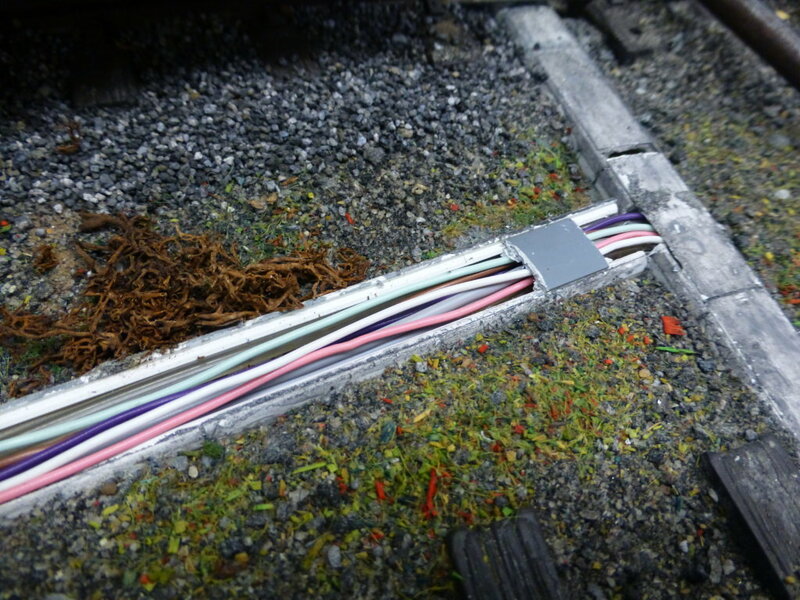 Tne Coloured Wire is the Juice Cables for the Electric Signals used on the entrance to this Shed. 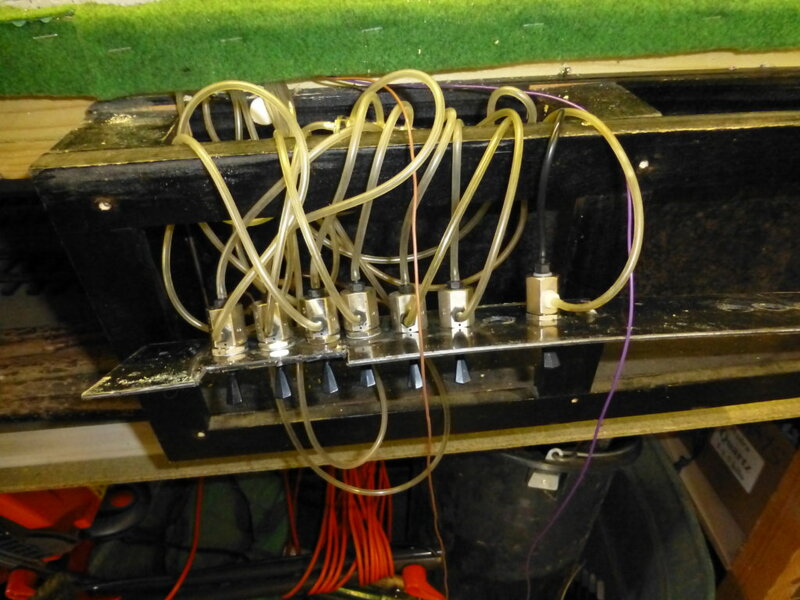 The Air Line connections all in place, does look a bit Complex but so much simpler than any method of Point Electrical Control. 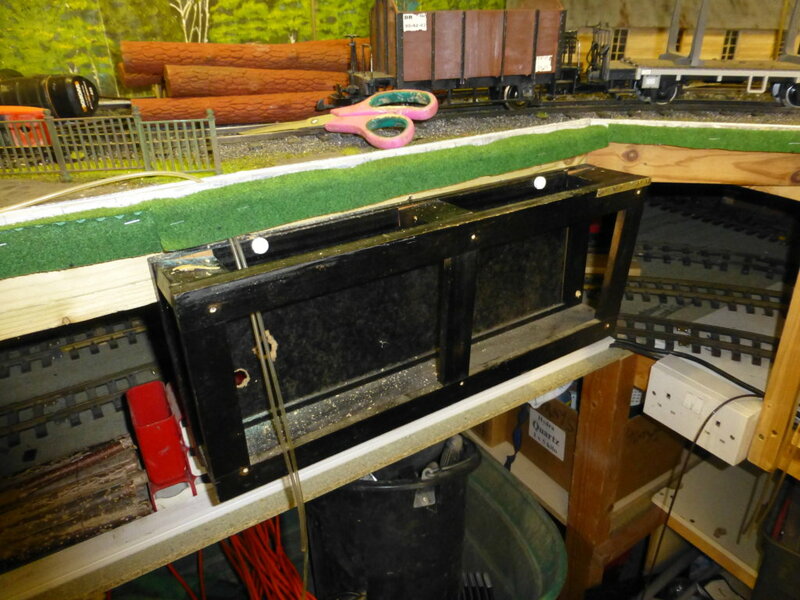 The new site for the Train Headers and Wagon Cards to go on the Trains. Little bit of recycling here, this was the Old Cover for the Central Heating Boiler that was replaced this Year. I never like to chuck out Metal that can be used for Magnets. The panel all fitted in place. The Air Switches shown a few pics up were located to the right where the Holes are still present. Would not have made any sence to move them to this Lication as 7 Air Lines would have needed extending for no purpose. In this revision I just reaollocated the use of Air Lines, thus no lenthening was required at all. Job done, will not know till next Year whether the move will make any difference to Congestion of Bods in the Shed. Time will tell on this one. 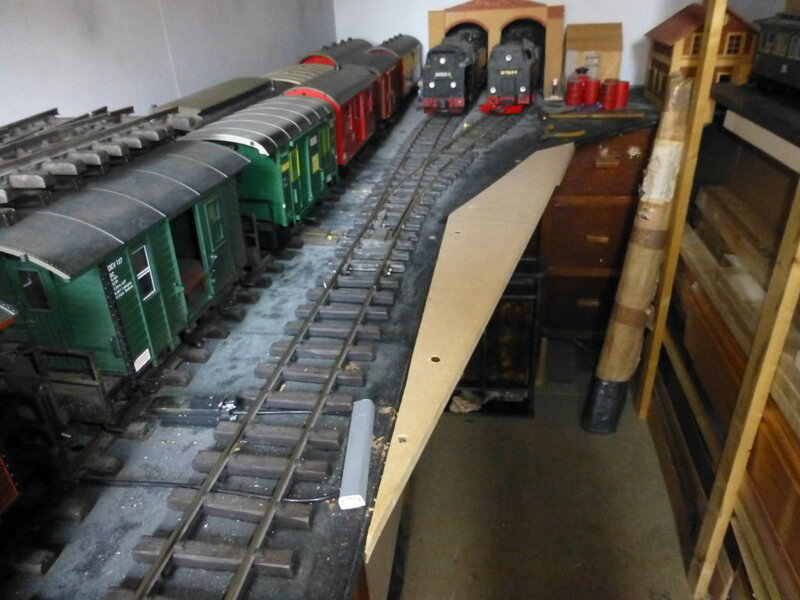 Certainly it has made Operations a bit easier as there is now somewhat less Walking to do whilst Shunting the Station. That's a good start Jon. So as I got finished with my morning stuff, my Local is doing Grub again after a Month or so off. So had a very nice lunch of Home Made Pie with Mash Spud and Veg. 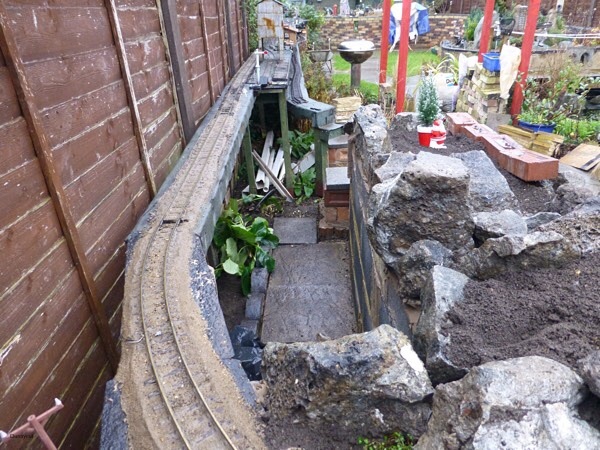 Suitably fortified I decide to get in with my Winter Garden Railway Project. 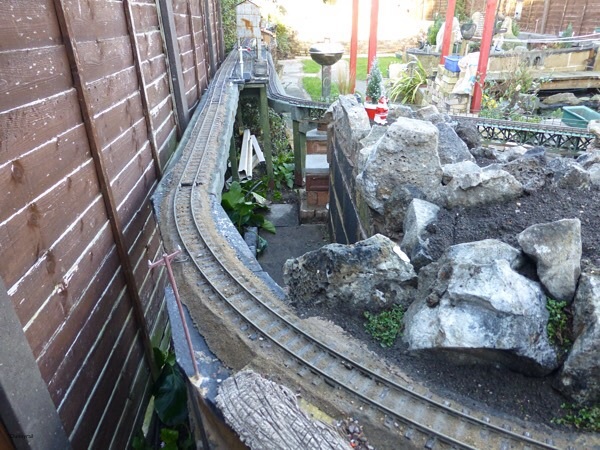 This has been on my mind for a while as there is a bit of a clamber to get to clean a short piece of Track. 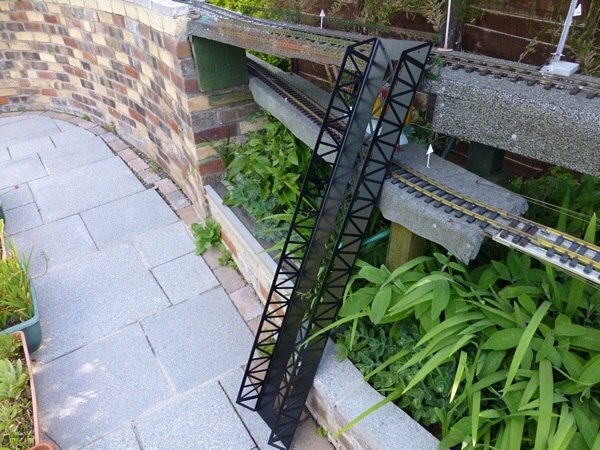 This was the site at the start of the day, though part of the Viaduct has been removed it is not convenient to remove it for Track Cleaning the area behind the Thistle due to Track Clamps. The climb over is just by the Wooden Post centre right a bit of Picture at the Top to a Single Brick Wall. Not good with advancing age. So the plan is to put a Proper Step or two in place at the rear around the left of the Conifer. After todays diging I gphave a nice area ready for the Foundations to be dug and Shuttered. The Skip Bag is full of Sifted Soil done today whilst digging out and a few plants and many Bulbs saved in Pots for replanting. Rough sketch below shows the approx idea. The existing Wooden Baseboards will not be revised in any way. 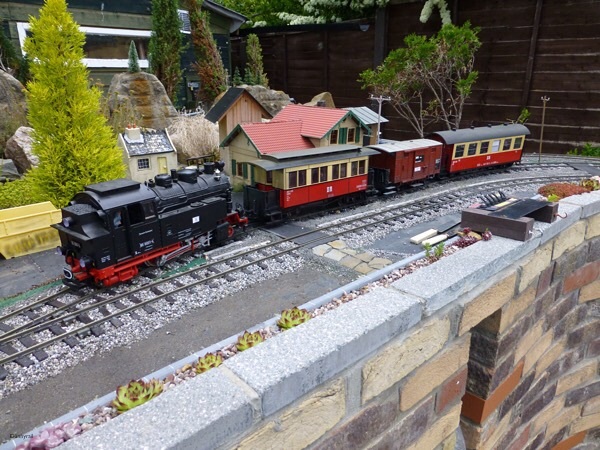 Black is the existing Railway and Walls of the Rockery. I intend to put some Buildings onto the Slabs to kind of Village the Scene some. Hope this all makes some kind of sence, more pics as the work progresses. But I have at least started, often the hardest part. Please Please do not hold your breath though on this one, it will be a Month or threee in development!